March 16, 2015 at 7:09 am EDT | by Lou Chibbaro Jr.
A bill passed unanimously by the D.C. Council in December that bans mental health professionals licensed by the city from performing so-called conversion therapy on minors became law on March 11 after clearing its required review by Congress. The Conversion Therapy for Minors Prohibition Amendment Act of 2014 imposes fines and other penalties for licensed therapists and other licensed mental health practitioners who attempt to change the sexual orientation of people under the age of 18 from gay to straight. The measure’s clearance by Congress makes D.C. the third jurisdiction in the nation, after California and New Jersey, to ban the therapy for minors. 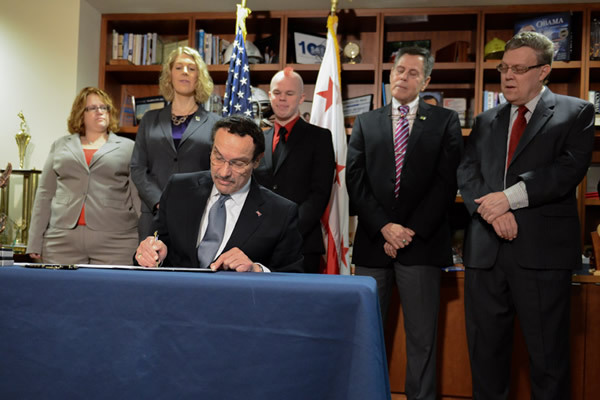 On Dec. 23, the day former Mayor Vincent Gray signed the bill, the New York-based group Gay, Lesbian and Straight Education Network praised D.C. for joining California and New Jersey in taking what it called needed action to protect LGBT youth from harmful forms of therapy. “These actions will protect young people from a practice that studies conducted by major mental health organizations and personal testimony from youth have shown can create dangerous and even life-threatening effects, including depression, decreased self-esteem, substance abuse, and suicidal behavior,” said GLSEN Executive Director Eliza Byard. Byard noted that conversion therapy is strongly opposed by all mainstream medical and mental organizations, including the American Medical Association and the American Psychological Association. Opponents of legislation banning conversion therapy for minors have argued that it discriminates against youth who want to change their sexual orientation and who willingly choose to undergo the therapy. Several opponents who testified at a public hearing on the D.C. legislation said they dispute claims that the therapy is harmful. But others that testified, including a gay man who said he was pressured into undergoing the therapy by his parents, said the therapy failed to change their sexual orientation and caused them to suffer emotional trauma. Several conservative groups that oppose LGBT rights called on Congress to block the D.C. bill under a provision of the city’s Home Rule Charter that requires all D.C. legislation enacted by the Council and signed by the mayor to undergo a 30 legislative day review by Congress. In the case of the conversion therapy measure, no member of Congress came forward to introduce a required resolution of disapproval for the bill. In recent years, Congress in some instances has sought to block D.C. legislation by adding an amendment to the city’s budget bill, which Congress must pass, prohibiting the city from spending any of its funds to implement a certain bill. Congress passed such an amendment to block the city from putting into effect a referendum approved by voters to partially legalize marijuana possession and cultivation. But no such amendment has been introduced so far to block the conversion therapy measure. Congratulations! Conversion Therapy is a farce. Science has proven what I already knew when I was a baby in a crib in the 1940s and was glad when science acknowledged it back in the 1970s. We need to educate civilization starting with the children that LGBTs are part of humanity so we will not have these nonsensical attempts.